More than seven in 10 small businesses describe themselves as confident about the UK business environment, despite economic uncertainty and worries over Brexit. That’s one finding of a new report released today by Square, which surveyed 1,200 small business owners nationwide. 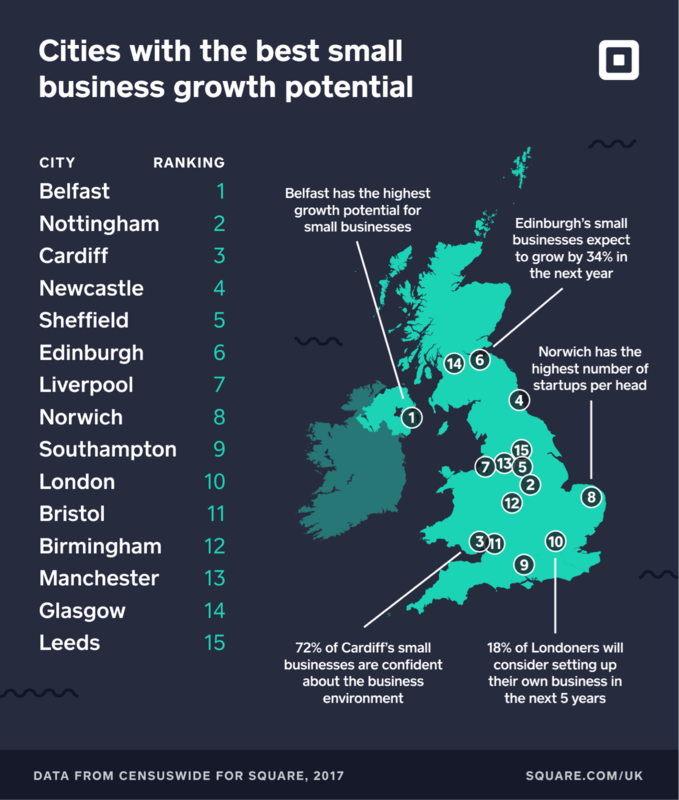 The study also created a ranking of cities based on their growth potential for small businesses, looking at regional differences including business confidence levels, growth expectations, technology adoption and infrastructure. Belfast came out on the top, with Nottingham and Cardiff in the runners-up spots. The UK’s capital city, London, appeared 10th out of the 15 cities ranked. Commenting on the report findings, Sarah Harvey, UK Lead for Square, said: “Much of the conversation about economic growth focuses on London and big business, but, interestingly, this research shows that it’s small businesses from all around the UK that are driving economic optimism. Square’s report overall provided a positive picture of each city’s small business sector and good potential for future growth. Small businesses in Belfast expected, on average, to grow 41% in the coming 12 months – substantially higher than the overall UK rate. Most revealing was the untapped potential to use technology to boost small business productivity and growth across the UK. The opportunity is substantial, as in most cities fewer than half use technology like contactless payment systems, internet-based communications tools, or software for point of sale services. Businesses in Liverpool demonstrated the biggest appetite to start using this new technology, with 49% of them considering deploying new solutions within the next 12 months. Support for small businesses is strongest in the South of the UK with the best broadband speeds and access to a range of SME networks. Bristol has the fastest broadband speeds of the 15 cities, according to Ofcom, with an average of 33.8/Mbps. While London leads for the number of start-ups established last year, Norwich actually had the most start-ups per head of population, at 167 per person. Emma Jones MBE is the founder of Enterprise Nation, the UK’s leading small business community and campaigning voice for small business. She commented on the study: “This country has such an exciting culture of entrepreneurship, so I’m not surprised that this study shows SMEs to be feeling confident about their future growth. Square, Inc. (NYSE:SQ) creates tools that help sellers start, run, and grow their businesses. Square enables sellers to accept card payments and also provides reporting and analytics, next-day settlement, and chargeback protection. Square’s point-of-sale software and other business services help sellers manage inventory, locations, and employees; engage customers; and grow sales. Square was founded in 2009 and is headquartered in San Francisco, with offices in the United States, Canada, Japan, Australia, Ireland, and the UK. *Taken from Office for Budget Responsibility. **Square commissioned a nationally representative survey of 2,044 consumers and 1,202 owners of small businesses around the UK, conducted by Censuswide between 15 - 24 August 2017.